Kings Beach is an urban recreational park in central Port Elizabeth in South Africa. 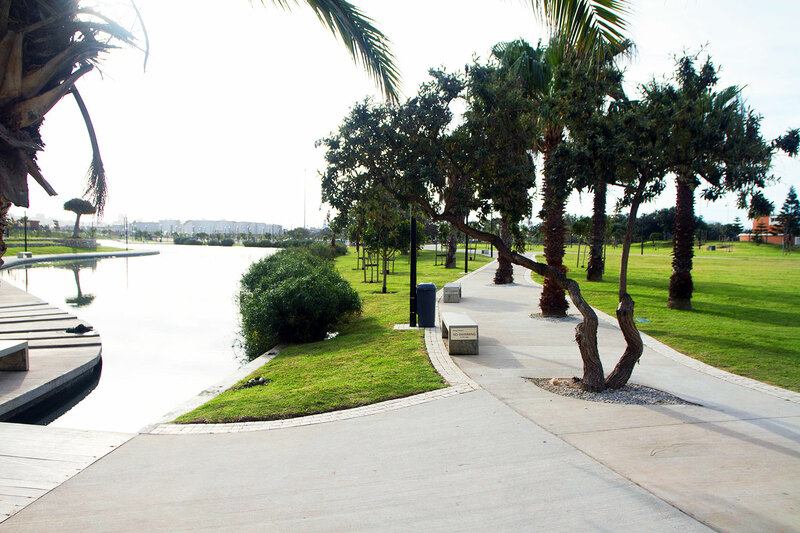 We were appointed by the Mandela Bay Development Agency to completely redevelop the park, which included the design of a skatepark, pedestrian routes within the park and street edge, play parks, picnic and recreational areas. The park was originally constructed on mobile sand dunes, which formed due to the construction of the harbor wall. The sea wall changed the beach into an accreting beach, with constant sand buildup. The dunes provide protection against storm surges but they also created a visual barrier between the park and the beach, which lead to unsafe beach areas. The original design of the park responded to wind, sand movement and storm water issues as the natural informants. Berms were built inside the park to create wind shelter. They were successful to some extent but when the wind really blows in PE, there is no hiding from it. The negative impact of the berms was to further limit visual permeability. The original vision behind the storm water master plan was to drain the storm water out over the beach to the sea, however the buildup of sand dunes rendered the plan ineffective and lead to constant flooding. Before the revitalization project, there was almost a complete lack of use and enthusiasm for the park. It was basically a derelict and dangerous space, green stagnant swimming pools, lack of maintenance, devil thorns on the grass, broken paving etc. The Park was basically only used by criminal elements, a few skaters and basketball players. People did not venture off Maternity Walk along Beach road into the park, even on market Sundays. 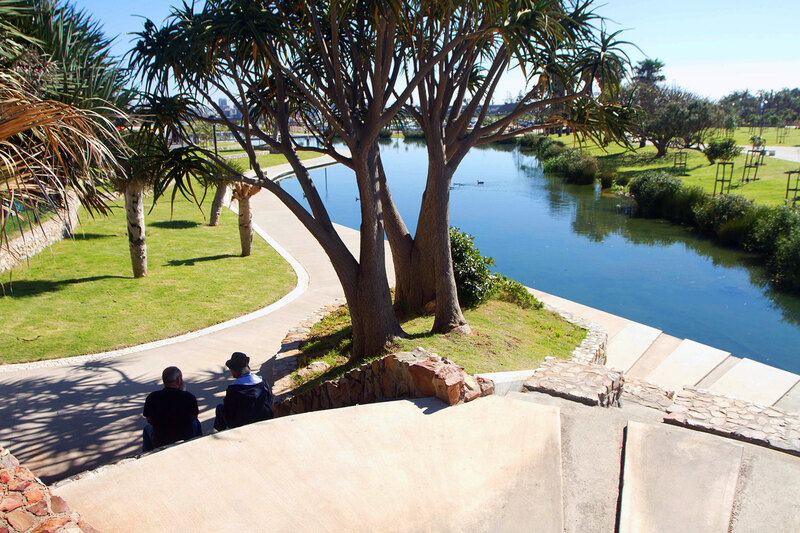 The revitalization of the park was envisioned and funded through Mandela Bay Development Agency (MBDA), the vision was to improve safety and uplift the surrounding neighborhoods expanding on their successful inner city revitalization projects. The vision expressed by Pierre Voges from the MBDA was to create an anchor feature to draw people in and turn the park into a major recreational facility while improving safety on the beach. We felt it was important to work with the layers of history within the park, taking our inspiration from designers such as George Hargreaves, we wove the layers of natural informants and history into a matrix and developing them into design principles. During the early design phase, Port Elizabeth experienced one of its worst droughts and severe water restrictions were implemented. Part of our brief was to not use any potable water for irrigation. The team discovered a valuable source of water immediately across the road. The Beaches Hotel was pumping groundwater out of their basement directly into the storm water system. The concept was to re-direct this water into an artificial lake on site (mimicking a ‘dune slack wetland’), from where the water could be harnessed for irrigation. The lake would also form a major feature within the park. The “urban” side of the lake has a hard concrete edge while the coastal side has a more natural wetland edge. The hard concrete side can deal with more traffic right on the edge of the lake bringing people closer to the edge while the soft edge has an ecological function filtering the water, providing habitat and absorbing nutrients. In response to the lack of visual permeability, we removed most of the internal grass berms, opening up the park. Many of the people who drove and walked past the park for years were not even aware there were swimming pools. While we were reshaping the topography to remove the berms and create the lake, we redirected the storm water flow into the lake, adding to its capacity and solving the flooding problem. The entire park is currently irrigated from the lake. PE has a large skating community and the client was therefore keen to develop a major skate park on the site. The old skate bowl had become a drug den, could only used by very advanced skaters and only accommodated one at a time. We designed a skate “park”, which could be used by skaters and BMX riders of all levels and ages, encouraging the more professional guys to use it during the week and smaller kids accompanied by parents on weekends. As children we loved playing for hours in small streams, chasing leaf boats and playing with pebbles, today due to pollution and general safety concerns, safe natural streams are hard to find in our urban areas. We found further inspiration in Green Point Park where a play channel was recently constructed. The groundwater source from the Beaches Hotel is day lighted in a circular pond from where it meanders through the play park before entering the lake. The play elements in the park are a mix of custom made elements and standard play park items. A wide slide (by Natural Architecture) accommodating lots of children simultaneously is one of the favourites. The pathway system was designed as a system of major and minor connections flowing through the park enticing people to move into the park and circulate through it. To change the old perception that the park is unsafe we added more and wider pathways throughout the park replacing patterned brick paths with in situ cast concrete allowing for free forms, the concrete is also very nice to skate and ride on making the whole park more user friendly and inclusive. Metal cut outs of birds were inserted into the concrete surface to add variety interest playfulness to the walkways. The cut outs were originally inspired by a request to insert a star for the mayor somewhere on the park. We played with the idea and eventually gave him a crown (Kings Beach), the crown forms part of a series of metal inserts gradually changing into birds and flying away. The inserts are repeated in different places in the park, while each entrance has a crown to bird grouping also relating to letting go of your ego as you enter the park and setting yourself free, at other points the birds simply cross the path relating to a shadow of a massive albatross or flock of small arctic terns. The massive asphalt parking area is exposed to the extremely harsh coastal winds with no protected pockets where trees will have a chance to establish. Typical trees would therefore have no chance of survival as can be seen on similar projects nearby where even Milkwoods (Sideroxilon inerme) are unsuccessful. The planting pallet for the parking area was chosen to not really focus on shade, but more on breaking the extensive hard surfaces. We chose Aloe bainsii, Aloe ferox and the variegated Metrosideros exalsa. The aloes are structurally strong enough for the wind and can withstand the heat island effect in the parking areas. A wetland was constructed to ‘polish’ the run off from the parking area, the overflow exits onto the beach through over the existing concrete slipway to the west of the site. Today the park is a favorite destination for a variety of users during the week and weekends. There is a renewed energy in the surrounding neighborhood, it would be interesting to be able to measure the value of park revitalizations on property values and therefore return on investment for the council through rates and taxes. On the negative side, there is an algal problem in the lake due to nutrients in the groundwater and the shallow concrete play channel adding heat, perfect conditions for algae to thrive. There is a final phase, which will address it, but even with the current situation, a resource previously wasted is being utilized creating a positive visual element, an aquatic habitat and a free resource for irrigation. A park of this size and intensity of use will always require maintenance and this one is no exception, but it does not have to be seen as a negative issue as it can provide much needed employment opportunities if managed in a positive way. Contact us now for expert advice on how to get your project started on the right track.